There is something so special and unique about fishing that makes it one of the most popular outdoor sports in the entire world. There is a feeling, an emotion, that millions of people feel the moment they can grab their pole and head to their local pond, river, or even on their boat into the ocean and toss their lines. As many fisherman and fisherwoman can agree, the entire sport is not more or less about catching the fish but rather the entire journey. That’s what we like to call a true life lesson. Now, all fishing experts can agree, tossing a line into the water won’t do too much, unless you have something tied to the end of it. If you are picking up on what we are trying to say – we are referencing fishing lures. When it comes to fishing, this market is probably one of the most saturated, complex, and challenging to master and understand. It’s constantly evolving and there is always a new product hitting the market. Now, if you are looking to stay on top of the industry, we are here for you. Today, we are proud to present the absolute options of 2018. Whether you are looking to bask in the sun and drop a line in the river or putting your feet up on a yacht – this list has an option for you. So, before you grab your fishing rod – let’s take an adventure down The Gear Hunt lane. When it comes to these items, there are certain things and elements that fishermen look for. With that, not every fishing lure is the same and intended for the same purpose. Certain options are meant to attract specific fishes and for different environments. With that said, we are eager to talk about the first item on this list, designed to catch a fisherman’s winning fish. Let’s talk about the Rose Kuli Multi Jointed Life-Like Swimbait and what users can expect from this. As we said above, certain styles are designed for specific fishes. This is where becoming educated is very important because without the right one in a specific environment an individual will have no luck. With that, this particular manufacturer of fishing equipment created an item that was designed for a wide target. This is designed so a fisherman can catch different types of fishes such as trout, muskie, pike, bass, and yellow perch. With that, this is particularly known as a great option for anglers. Another incredibly important aspect is the hook. Without the right hook catching the best fish is nearly impossible. With that, since the hook will primarily be in the water, it has to also be rust-proof or at least, rust-resistant. With that in mind, this manufacturer spared no expense by developing options that are rust-proof. With that, users can rest assured that they are receiving a quality piece of material that will not break or rust easily. As far as cost and value for these products, they tend to be around the same price. However, obviously, some will be more expensive depending on the task at hand. With that, this is definitely worth the price and in fact, it has 4.5+ stars. With that said, many users are happy with this and this brand offers this in more than six different color choices. With that, users trust the quality. Now, if one was to try and buy or collect all the different versions, it possibly could be a bit more expensive. Quality rust-proof fishing lure made from quality materials. 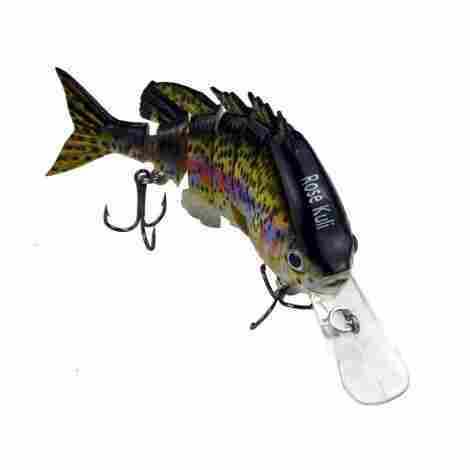 A topwater fishing lure that includes a 3D holographic eyes. The verisimilar body resembles a life0like fish. The artificial bait is reusable and environmentally friendly. Users tout the quality of this fishing lure and the variety. Users have mention you have to finetune the fishing lure to try and get it to swim like a proper fish. Since there is such a large and endless supply of options, we wanted to switch it up a bit. Therefore, we want to introduce a set. This set is perfect for individuals that want to start off with a wide variety of options and are beginning to learn the purpose of different styles and what they can use them to catch. With that, we want to share the LotFancy 30 Piece Set and what users can expect from this. Here are two points worth noting about this set. It goes without saying that bright colors attract certain fishes. With that said, users can expect a wide variety of different color choices to choose from. Instead of collecting lures one by one, this is the perfect gift set for an individual starting out. With that, the bright colors include blue, red, green, and even silver to resemble more life-like fishes. Also, the set is designed to catch different types of fish and the variety include Walleye Baits, Bass Minnow Popper, and more. One of the most important elements when it comes to these products is the material that it is made from. The reason being is that the right product will be made from a high, strong and durable material that will be able to handle the wear and tear of fishing. This wear and tear includes pulling, scraping and more. With that said, users will appreciate that these are made from a PVC material and stainless-steel hook that is rust-resistant and designed to withstand the test of time. More than that, the 30 piece set comes with an organizer so users never lose track of their gear or which one is which. As we talk about cost and value for this particular option, we can say why it is one of the most popular sets out there. First, LotFancy is a reputable brand with plenty of years of experience in the fishing field. Therefore, their manufacturing process is superb. Other than that, this set is designed and priced to sell fast. Considering that there are over thirty items, that means each is well below a dollar for the price. With that in mind, we believe this is a great gift set for the fisherman of the family or the aspiring fisherman. A high-quality set designed to attract big fishes. Very colorful options that look appealing. The sizes vary to attract different size fish. 1-year warranty with a money back guarantee. Stainless-steel hooks are well designed and durable. Users have mentioned they are somewhat light. This next option is not a set, and it sure is a bit pricier than one dollar. However, this is intended to be one of the best. In fact, users tout the quality of this brand and the fishing gear that they offer. 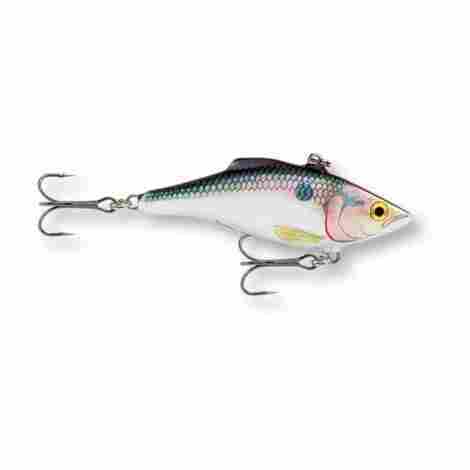 With beautiful colors and life-like fish design, we are eager to share the Rapala Rattlin 05. 05, in particular, is considered Shad color. 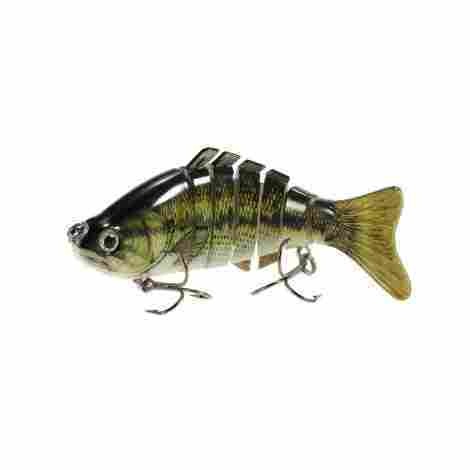 However, this manufacturer offers eight different color choices ranging from silver to a bluegill fish design. Let’s look at two quality aspects of this particular option. Have you ever gone fishing and gotten a couple bites, then once you go to reel in your catch there is nothing there? Well, upon further inspection you notice that the tail or head has multiple scratch marks but not fish attached to it. This may be because you are only using a single hook design. This manufacturer develops a double treble hook design, so individuals are ensured the catch of the day. With two hooks, there is no way a fish can escape! One of the most important aspects of the manufacturing process is the testing process one the product is complete. This allows for a brand or company to properly manufacture a product. With that in mind, this manufacturer has gone through extensive testing to ensure that individuals are receiving a quality hook. The testing includes a tank test and hand-tuning to ensure the product works. With that said, the built quality is outstanding. It is designed from VMC black nickel that can withstand the test of time. As we take cost and value into consideration for this particular item, individuals should expect a quality product designed to bring in the catch of the day. With that said, this is appealing, sturdy, perfect for slow or fast reeling. It also has a harmonic sound frequency that when it splashes on the water sounds like an actual fish, which attracts the fish around it. Now, as far as cost we consider this one of the most affordable ones, considering the price is per item and not a set. Either way, novice or expert fisherman will not be disappointed. A high-quality fishing lure that users will appreciate. Designed for slow and fast reeling. Different color choices to choose from that resemble real fishes. Durable and able to withstand hard pulls. Specially designed sound chamber to resemble fishes in the ocean. Users have mentioned the weight is only 9 grams, not 11, which can be deceiving. 4. TB Tbuymax 10 Pcs. It’s time to talk about another quality set. This next set only comes with 10 pieces, compared to the twenty-piece set from earlier. With that in mind, the set is very different than the first set because it is specifically for certain fishes and it is designed differently. With that in mind, we want to introduce a great quality set made from premium materials. This is the TB Tbuymax 10 PCS. Spinnerbait Set. Here are two points to take into consideration. A very important aspect is the design and how it appears, not to us, but to fishes. With that, this brand focused on developing brightly colored items that included a colored strike-attractor sleeve. With that, the sleeves are made from different colors so individuals can test out which one works best. The sleeves itself are designed to catch fishes like Bass, Trout, and Salmon. Now, users have mentioned that the sleeve design has helped them attract and catch different fishes, increasing their catch rate. Another important aspect of a properly designed product is the material that it is made from. With that said, these are designed to withstand the test of time and can withstand hard pulls and scratches from multiple fish. With that, the rooster tail styles are designed for use in both types of water, which users will appreciate. Other than that, the material of the hook is made from metal, which is known as one of the strongest material out there. As far as cost and value, we cannot help but take into consideration that this brand is highly touted as one of the best for their price. With that, users will appreciate this set because of the quality, the style, and the fact that it comes with a plastic organizing tackle box. The tackle box makes everything much easier to keep track of. With that, if you take into consideration that an individual is only receiving ten instead of twenty, then you can be guaranteed that it is half the price of the other set on this list. Lastly, users are very fond of this brand and their quality products, which is only enhanced by these. Perfect for both water types. Striking design that are high quality that users will enjoy. Fun to hook on and use. 2 plastic tackle boxes are included for better organization. Each comes with a sharp treble hook. The design is a more modern design from the brand. Users have mentioned that the metal hook has rusted after long-term use. It’s time to introduce another singular product that is designed for specialty fishing and professional fisherman. Now, some products are for more specific fishing and for different levels of fishing experts. With that, this next option is a quality product for individuals that are looking to get a quality item with a great quality design. We are eager to share the Lixada Fishing 7 Segment Lifelike Swimbait, a wonderful addition to any fisherman’s tackle box. Now, depending on the size, style, and material, these items will have different effects on the water. The effect will determine how attracted the fish will be to item. The bigger fishes are more attracted to life-like options that resemble small fish. With that said, this is designed to resemble small fish due to the life-like 7 segment swimming design. The fish is separated into seven different segments that when in the water, will sway back and forth once an individual begins reeling in. This creates a life-like swimming experience. When it comes to fishing equipment in general, brands have begun creating eco-friendly materials that in the case of an accident, will not harm the fist or the ecosystem. With that, this topwater option is made from a high-quality ABS material. This material is also odor-free, to attract fish, and it is environmentally friendly in the case an individual loses it on the water. With that in mind, individuals can rest assured because of the strong ABS material that it is very durable and can withstand the test of time. Let’s talk about the cost of this and what individuals can expect. Well, it is designed as a specialty item and sold as an individual. With that, the price is considered somewhat expensive if you keep in mind that you can get 10 pieces for the same price. However, the quality is unparalleled. It is high-quality, it is easy to use, it is durable, it is eco-friendly, and the list goes on and on. What we can say, is that this is a perfect gift for individuals. A high-quality item for more professional fisherman. Widely applicable to be able to catch all sorts of fishes from yellow perch to pike and trout. Designed for a strong loading. 7-segment multi-joint design resembles small fishes. Designed for users that want to collect quality fishing lures. Users have mentioned that they have not caught a fish as easily as they would have liked with this. As another properly designed option, we are excited to talk about this skinnier and longer fishing item that includes an eight-segment design. With striking colors, a beautiful appearance, and quality in mind, this brand is known for creating specialty fear that can withstand the test of time. Let’s talk about the materials and the design and what makes this one of the best for collectors and expert fisherman. Here is the Superstrip 5/8 Ounce 5-Inch 8 Segment Swimbait. Here are two points to consider. This is known to be very durable and withstand the test of time. With that, the colors will not easily fade or scratch off. Now, the most important part is the hook design. With a proper hook an individual will not be able to catch a fish properly, or worse, the hook will rust and fall off. This hook, in particular, is made from black nickel and is considered a treble hook. With that in mind, individuals can rest assured that once a fish bites, they can reel it in. This is designed to resemble life-like fish. How does it do this? First, this has an eight-segment fish-design that resembles that of real fishes. Once an individual casts and begins to reel it in, the design of the fish will move back and forth as if a fish was swimming. This natural movement will attract the attention of bigger fish, which will then bite onto the product. With that said, the colors are meant to resemble a striking appearance to specific fishes. The color replicates the patterns of actual bait fish for a more authentic fishing experience that ensures the catch of the day. As we take cost and value into consideration, users should expect the price of this to resemble that of many individual specialty options. With that said, an individual not only buys this to catch fish but to collect. The quality, the appearance, and the style is what makes it really appealing. More so, the segment-design is a fan-favorite among expert fisherman because they feel that they can catch more fish with it. Either way, the quality of this is expertly crafted and designed with quality in mind. High-quality from a trusted brand. 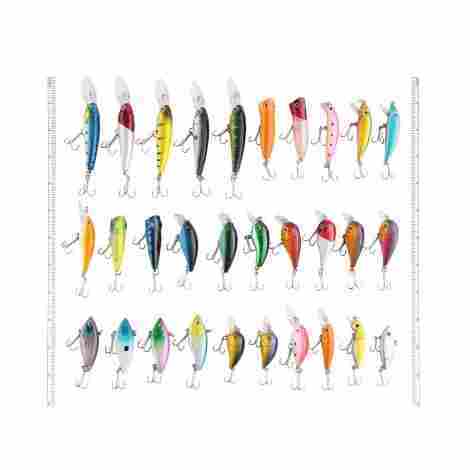 Different color choices and fish styles to choose from. Value resembles the price quality. The treble hook is durable and strong enough to catch proper fish. Individuals will appreciate the durability and flexibility of the hinge. Perfect for expert fisherman and collectors. Users have mentioned that reeling slowly does not appear as life-like as when they reel fast with this. As the next product on this list, we had to switch it up a bit. This next option may be considered the most authentic and lifelike considering the design. Intended for bass fishing and pike fishing, this is the most lifelike frog that an individual can buy today. Let’s talk about what makes the Lunkerhunt Linker Frog Series the best fake frog an individual can buy for fishing. Here are two features and important points about this particular product. This particular frog is designed to be like a life-like frog. In fact, the style of the frog includes a super soft body that is weedless and replicates an adult frog. Now, in particular, the legs are designed to resemble a large adult frog. How? The legs, in fact, extend during the retrieve and retract when an individual pauses. Meaning, as a fisherman begins to reel in slowly, the legs of the frog will extend like a real frog and then retract once the fisherman has to stop reeling. Therefore, it is best for an individual to reel in slowly to enhance the swimming style of an adult frog. When creating something as a life-like frog, this manufacturer had to go to great lengths to try and create the best quality frog design out there. In particular, they developed the frog to have its hook between the legs, so it is not easily identifiable. With that in mind, the lunker frog features a high-quality design that includes a sticky and sharp 4/0 gap hook. The hook is wide enough that any fish from any angle will latch on and not be able to latch off. As we talk about cost and value, we have to keep in mind this is quite different than many of the options out there today. In particular, individuals will appreciate the design quality and many different color options to choose from. Other than that, this is also a perfect gift or collector's item for fisherman. However, considering that it is different than a regular option, it is designed for the expert fisherman that want to use a different style. High-quality frog design with over six different color options. The lunker frog is designed to resemble life-like frogs. A great gift item for any fisherman. Super soft body to resemble the body of a frog. Users have mentioned a lot of success with this frog. Users have mentioned that it can get destroyed quite easily if a fish is very strong with it. This next fishing set is for the bass fisherman in all of us. We are eager to share another quality set with plenty of features and benefits. 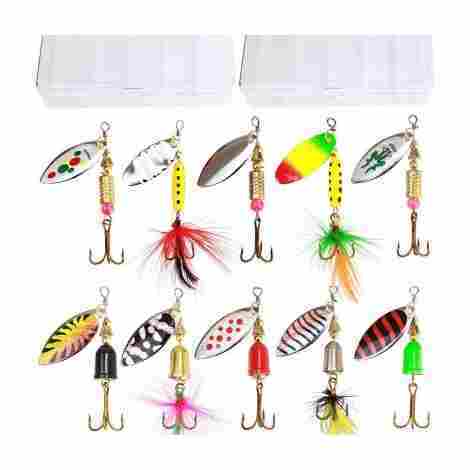 With this set, an individual will rest assured that they will never be missing a lure again. In fact, the set brings sixteen different trout options that come with a sharp treble hook and beautiful color design. Let’s talk about this product and what users can expect from these. Here are two important points. One great aspect of this particular manufacturer is their quality materials that allow for individuals to use them in both types of water. With that said, individuals will love these rooster tail options in both waters when catching fish. The rooster tail appearance is high quality and designed to withstand the test of time. With that, users can expect that when not used in freshwater, these will be very durable and not rust easily, a great benefit when fishing for long periods at a time. Another great aspect is that they offer a carry option. In fact, an individual can opt in for a black carry bag with a strap and zipper that is easy to use, lightweight to carry, and efficiently holds all the lures together in place. Or, an individual can get the white/clear tackle box design that organizes all of the gear in place. 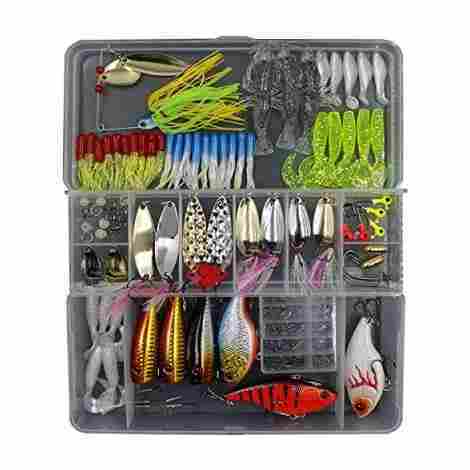 This bonus option allows individuals to get their fishing equipment properly organized. As we take cost and value into consideration, we have to consider that this is a quality set that individuals will appreciate and enjoy. The set is designed to resemble life-like fishes and it is primarily designed for bass, trout, and other fishes of the same family. With that in mind, users appreciate the quality of these and feel that the material of the hook itself is durable and strong. 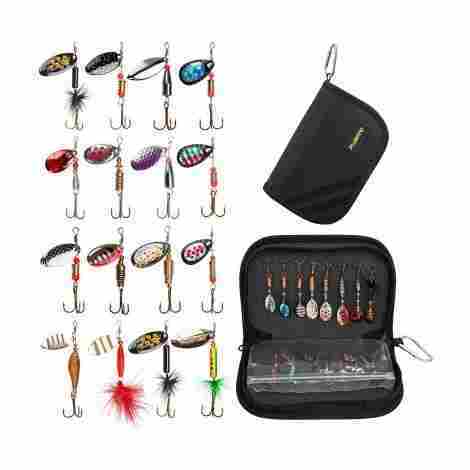 For the price, considering an individual is getting sixteen pieces, not including the bag or the box, we believe it is a great gift for novice or professional fisherman. Users tout the quality as one of the best as a rooster tail lure. A trusted brand with plenty positive reviews. We are coming close to the end of our product list and we are eager to share the next option with our audience. These are frog fishing options, but unlike the other similar products on the list, these come in a set of five. With that in mind, we are eager to share the quality of these, what users can expect and what makes them one of the best options out there. With many positive reviews, we want to share the Runcl Topwater Frog. Here are two important points users should consider. One would think that it is very difficult to resemble a live frog. More so, if the design needs to be able to withstand water, scratches and other elements. With that said, the body design and detail that this manufacturer has brought to this particular frog design is superb. In fact, we believe this may be one of the best frog baits out there. 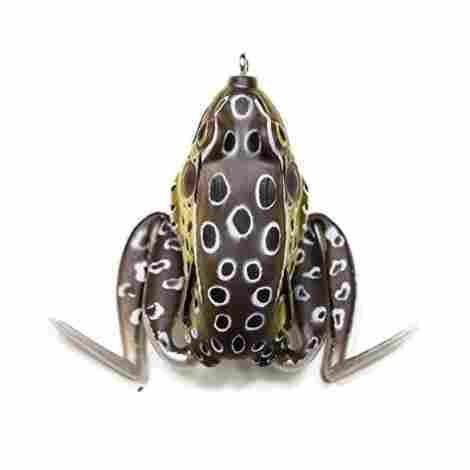 The body detail resembles life-like swimming frogs and have a high-resolution paint design. More so, the movement of the frog replicated a real frog or bullfrog. Now, one important aspect that this manufacturer took into consideration is that the difference in design elements may enhance a fisherman’s ability to catch the perfect catch of the day. With that, this brand has created a pack of five different options. 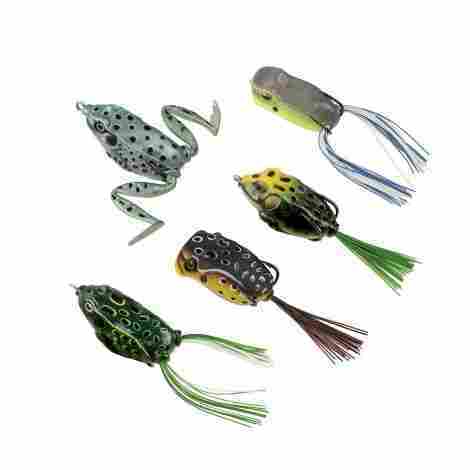 The frog lures include one frog that is a 2-legged frog that resembles the swimming style of a frog, frogs with skirts, and popper frogs that also have a skirt design. With that in mind, users can decide on the best frog to use depending on the occasion. As we take cost and value into consideration, we cannot help but compare to the other frog on this list. This manufacturer has included five different colored frogs with different styles for only a couple bucks more. With that said, we believe that is a great deal for this variety pack of frogs. More so, individuals tout the quality materials of the set and believe that this brand delivers when it comes to quality and authentic design. Quality designed frogs that are created to resemble real frogs. Five different frogs in a pack. Different color options and styles to choose from. Environmentally friendly PVC material that is durable. Users have mentioned some of the frogs sink too much. As the last manufacturer on this list, we had to try and go out with a bang! We are eager to share with our readers the best set for beginners that want to begin their fishing journey today. This set includes everything an individual needs as far as lures to get started today. This set is high quality, has many positive reviews, and even comes with a plastic fishing tackle box to organize it all. Let’s talk about the Threemart Fishing set and what users can expect from this quality set. Now, when an individual wants to learn how to fish, it can get really expensive very quickly. With poles, hooks, and equipment users are looking at easily spending hundreds if not thousands of dollars. Therefore, this manufacturer has made it easy for individuals to begin their fishing journey easily and effortlessly. With 151 pcs in total, users can expect hard, metal, spinnerbaits, soft, and even hook sets. This is a deal that cannot be passed up! Individuals are guaranteed with this set that they will have the ideal starter fishing journey. This brand has made it easy for individuals to begin fishing right away. With that, this set is primarily designed for freshwater and the pieces will rust easily if used otherwise. However, the quality of the set is really great and designed to last. However, users will eventually, as they get better at fishing, upgrade to other better pieces of equipment. As we take cost and value into consideration, users should keep in mind that they are receiving 151 pcs of fishing equipment. Now, users should expect that the colors will be picked by random but it will not affect the quality and quantity that an individual receives. For the price, we can say that this is one of the best sets out there for individuals looking for quality and quantity. Huge set with many pieces to choose from. Great birthday or Christmas gift for the fisherman in the family. Plenty of pieces and hooks in case some get lost during the learning period. A tackle box is included. Users have mentioned that this set is cheaply made. Who knew the market can be so expansive and exciting? So, now that you had the opportunity to learn about the absolute best of the best, let us ask, what product stood up to you? Imagine you are about to cast your line in the water, what do you imagine on the end of your line? For us, we are a huge fan of the Rose Kuli and Rapala brand. After casting thousands of lines with options from these brands, we can say with confidence that these products are fantastic. Moreover, when it comes to this buying guide, our genuine intention was to provide each of you with the most comprehensive information, alongside tips and tricks, to enhance your tackle box this spring and summer. Which peaked your interested? Any bites? After spending countless hours studying and evaluating the market, we can see what makes purchasing one such a process. The truth is, this market is easily one of the most saturated aspects of fishing. I mean, walk into a local sports store and the bait isle take 3-5 isles alone, in some cases, more! Can you imagine how hard it must be for other fishermen to make a decision? Well, this was precisely the challenge that we wanted to overcome and solve with this buying guide. Now, you might be wondering, how were we able to highlight the best on the market, granted there are so many different options? Well, what we did was create something more commonly known as the Criteria Used for Evaluation. At the core, this was a system that we used to analyze each product in efforts to pick out the best products and weed out the rest. Some aspects that we looked at were the colors and designs, the cost and the value, and even how it performed in the water. While it was not easy and took a wealth of time, we are proud to share all of this with you. If you want to learn more about the criteria we used, continue reading! When we first started this buying guide, the first piece of criteria that popped into our mind was the build. We wanted to ensure that, if our consumers were purchasing an option, it was the highest quality possible. Now, when it comes to these products, as you can probably agree, it’s challenging to tell whether it is high-quality or not. Reason being, manufacturers tend to produce either decor or real options; however, they both look the same. With that being said, we had to do thorough research to ensure the quality of build and construction of each item for our list. This research included extensive third-party research, studying the manufacturer’s description and even looking at different consumer reviews. In doing so, we can guarantee that our list features only the highest-quality built fishing products at the time of writing this guide. Aside from the quality of build and construction, the other most important aspect is the hooks. Now, for experienced fisherman, this goes without saying. However, most people really don’t take into consideration the hooks and how they work. The truth of the matter is, if the hooks are large and apparent, it can easily scare away fish. So, it’s important that the manufacturer should cleverly design the item to infuse it with subtle hooks – yet large enough to capture and hook the lunkers. With all of this in mind, when we evaluated each we took this seriously and really paid close attention to the hook design innovations and technology. In fact, as you might have noted, we even shared highlights for many of our products that revolved around their hook design. Now, we were able to get to these conclusions by not only looking at pictures, but also looking at the way the manufacturer talked about the hook system – and what the previous fisherman would say about their experience with the hooks. In previous articles, we used to say that colors and designs were not important. However, to fish, they are CRITICAL! We cannot stress that enough. With that being said, knowing the importance of colors and designs, we wanted to make sure that any product that you read about today came featured in a wealth of different, bright, and vibrant colors. Additionally, we also wanted to offer consumers a wealth of options. On our list, you will find products that are incredibly life-like. The reason is that these models and designs are also appealing to fish, helping to attract bigger fish. In our opinion, there is nothing more important than evaluating the cost and value of a product. Now, the physical product is vital; however, we are talking more aside from the materials and the quality of the design. In this criteria, we are really focusing more on how the product is marketed and what it really offers each consumer. Now, in our experience, by using and understanding the importance of the cost and value, consumers can really figure out whether a product is worth their consideration. For this buying guide, we started off by analyzing the market as far as costs. We wanted to know what products were the priciest, cheapest, and what the middle ground was. Consider this like metaphorically dipping our fishing rod into the waters to see what it’s like. Now, before a fish could bite, we furthered our research by studying each individual product and what it offered consumers. By comparing the value of the product to its price tag, and other products, we were able to draw strong conclusions and selecting the most valuable products for your consideration. Have you ever purchased an item and, after putting into the water for the first time, for some reason it moved more like an injured, sad fish rather than an upbeat fishing lure? It has happened to all of us! To avoid this problem, we did our research to bring only the best performing options in the water. Many of these products today have been tested in the waters to ensure the best and most appealing movements for fish. This research entailed looking for videos online, studying the manufacturer’s description, and cross-referencing any and all information with the previous fisherman who had experience with the product. It’s an understatement to say that the materials used to make these products are important. The truth of the matter is the type of materials that are used in making the product directly influence whether or not it will attract fish, and how long it will work for. With that being said, aside from everything else that we mentioned on our list today, another criterion that we took seriously was scanning each product for the materials used to make the product and the hooks. If you are looking for options made from durable and long-lasting materials, snag one of these while you can! The whole purpose of these products is so that a fisherman or fisherwoman could tie it onto their line and drop it into the water to catch a fish. Now, we can tell you, this is not always the case with many products on the market. There are some products that appear to be more visually appealing rather than for attracting fish. Additionally, there are many products that do not offer consumers the functionality of being able to be used in a wealth of different environment. This was a big concern for us. Reason being, we wanted our readers to be able to use their new product in many different fishing environments. That’s why, in today’s buying guide, many of our products are notable for their versatility. We also shared with you a few kits, in which consumers can have a wide selection of top-notch options for any environment. Q: How deep does it dive? With that being said, if you want to know more about the depth capabilities, look at the manufacturer’s description. Also, since many consumers are wondering this question, see what other fisherman are saying in their reviews. Q: What are the best colors or designs? A: This is a question that many fishermen often wonder and ask. We all want to catch and fish and we all know that the color and design makes a difference. Now, while we might not be able to read fishes mind, what we can say is that some of the most favorable colors and designs are anything close to red and orange. The reason is that it mimics a bloody bait and, that is incredibly exciting to a big fish. 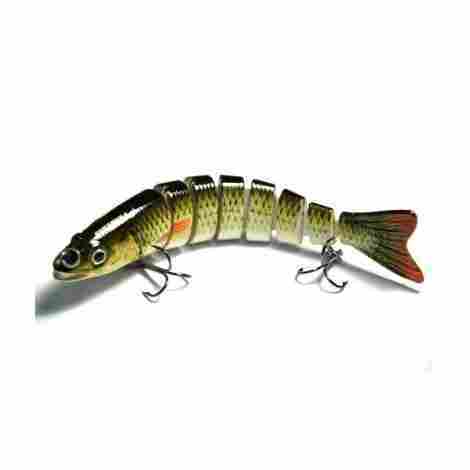 Additionally, another great option is to purchase one that is life-like and looks like a mini fish, or bass. These colors and designs have proven to be quite effective for fisherman. Q: How do you know if it is for fresh or salt water? A: If you are new to the fishing industry or looking to purchase a lure for someone, whether a birthday or holiday gift, it’s important to know there is a difference between them. Now, to find out, you need to look specifically at the manufacturer’s description of the product. Typically, here, they will share what it was made for. We did notice when doing our research, there are many companies that do not share what environment it was intended for. So, if that is the case, look at the customer reviews and you will find your answer there! A: To the surprise of many fishermen – it’s incredibly important to perform regular maintenance on your fishing gear. Failure to do this will not only result in the wear and tear of the products – but also, it can directly impact the quality and performance and inability to attract fish. With that being said, cleaning them is incredibly easy. All you need to do is safely use a soap solution with water to remove any bacteria and stains. From there, you can use a smooth, soft cloth, with care, to remove the soap and any stains. We do suggest, before using any other chemicals, read the manufacturer’s label on the product to see what they suggest.